I really must stop this self-indulgence. But how can I resist the urge to spread this image around? After all, it does come from his very own web site. 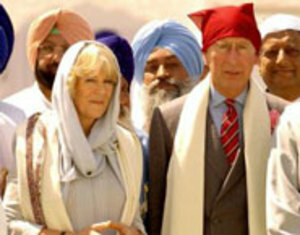 This time, HRH has donned what looks like a leftover peg bag to show his respect for Sikhism in the course of their visit to the Gurdwara at Anandpur Sahib, India, the second holiest site to Sikhs after Amritsar. It seems to be the way with the Prince of Wales to conduct a tour of a couple of key Islamic countries, making speeches advising Muslims how to develop their religion, before jetting off to India. No doubt demonstrating his thoroughly green and carbon-emission reducing credentials. Daniel Pipes' running log of the Prince's pronouncements on Islam drew my attention to an extraordinary statement, made in the course of a speech he gave in Saudi Arabia on Sunday. HRH seems to be suggesting that Islam is the Abrahamic religion which really understands the interpretation of texts, for which it sets an example to the other two Abrahamic faiths, Christianity and Judaism. 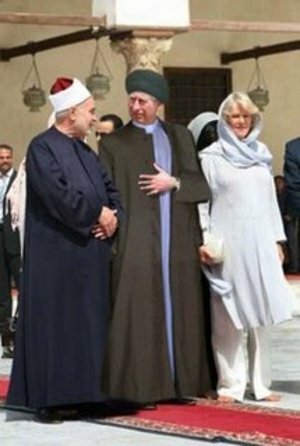 The heir to the throne of Great Britain, HRH the Prince of Wales and the Duchess of Cornwall, during their visit to Egypt and sundry other places in north Africa. I know HM Queen is hardly a snappy dresser. But she's managed to cope for over fifty years with visiting a great many sacred places of religions other than her own, and show respect for their faiths without ever feeling the need to .....And that includes her readiness to go barefoot when visiting a Hindu temple. Years back, at the height of the fashion for an approach to "multicultural education" which got characterized as "saris and samosas", there was a colleague at my university, a lively and otherwise down-to-earth working class ethnic Englishwoman, who insisted on dressing herself in a sari whenever she presented lectures on the subject to our teacher trainees. I just used to wish the floor would open up and swallow me when I had to sit there and watch it. And then, even worse, when I found trainees attempting to follow her example in classrooms crowded with children from Pakistani and Punjabi families. I would have thought the brilliant reverse portrayals of "Goodness Gracious Me", written by Meera Syal, Sanjeev Bhaskar and other British Asian writers, had put paid to that sort of nonsense for ever. But no. Perhaps HRH thinks he might pass muster as some sort of Imam in waiting? Time was when eccentric toffs like him fancied themselves dressed up in Arab tribal dress, like Lawrence of Arabia. And of course he grew up being dressed up in highland kilts, an absurdity initiated by his great great great great grandfather Prince Albert von Saxe-Coburg-Gotha when he and Victoria first played at being traditional highland lairds. He still wanders around looking almost as silly in a kilt during his summers at Balmoral. image from here, via here, which llinks to some more images of HRH in similar garb here. Apparently, Ken Livingstone has tried to brush aside accusations that his "go back to Iran" remarks about the Reuben brothers were anti-semitic, because he says he thought they were Iranian Shias. He says he didn't know they were Jewish. He said he had not been aware the brothers were Jewish and from their names would have thought they were Muslims. Yeah, right. David and Simon Reuben. Very Iranian Shia/Muslim names. And of course he's been sounding off in public about the Reuben brothers since last October. And just managed to go on not knowing that these brothers, whose web site tells you that they are Indian-born Iraqi Jews, are Jews. And even the Evening Standard's press article about Ken's objections to them last October mentioned that they are Jews of Iraqi origin. Even if they were Iranian Shias, it would still be utterly reprehensible and racist for someone holding the office of Mayor of London to tell them to go back where they came from. But with his usual relish for being gratuitously viciously offensive, Ken has gone on to add to his insults to the Reuben brothers. If you're into signing an online petition objecting to Ken's racism, there's one here. It seems that Ken Livingstone, the mayor of London, has made a political judgment that it is good for his public image and electoral prospects if he employs low-level racist abuse against Jews every now and then. David T at Harry's Place and Melanie Phillips have been carrying news of an extraordinary outburst which Ken Livingstone seems to have made at a press conference today. This conference was about the massive redevelopment in east London's Stratford that's part of the 2012 Olympics project. Ken doesn't like what's happening with the property developers involved. He chose to refer to two uninvolved Jewish property developers, Irving Sellar and Gerald Ronson who he apparently sees as having "a commitment to the city, they have a pride in creating great building[s], they're proud they are creating jobs, they actually, they share [a] sense of being Londoners"
But then he trashes rival property developers, the Reuben brothers, who are Bombay born Iraqi Jews, and who he represents as just being out to squeeze as much money as they can out of the project. I deal with many property developers, Irving Sellar, Gerald Ronson… They're there to make a profit, they also have a commitment to the city, they have a pride in creating great building, they're proud they are creating jobs, they actually, they share sense of being Londoners, I see no evidence of that from the Reuben Brothers. They just simply[see] how much they squeeze out of every single deal. On the Reuben Brothers, I think they've responded to what you said about them in the south of France is that you've never met them, never talked to them. Have you made any representations to them? Have you asked them to come and see you? Have you asked to see them? What evidence do you have that they're not really committed? Well just the evidence from people in the … meetings where they've been screaming and throwing their weight around and just also the evidence of their role in the collapse of Paddington hospital deal. No I haven't met them, and that's one of the things that is surprising. I mean most of the major property developers who've had an interest in this city come along to my office, get involved, make sure their plans are acceptable to my planning officers, make a reasonable contribution. We've never had any approach from the Reuben brothers, perhaps they're not happy, perhaps they could always go back to Iran and see if they do better under the Ayatollahs. Yes, really. Red Ken, the Mayor of London, who prides himself on his welcoming attitudes to asylum seekers and migrants, appears to do the standard racist thing of telling "foreigners" he doesn't like to "go back where they came from". Of course, the Reuben brothers never came from Iran, and don't ever appear to have traded there. But it's clear enough what the Ayatollahs do to Jews they don't like. Or maybe he thinks the Reuben brothers just "look Iranian". It also happens to be the case that the Reuben brothers came to London as schoolboys in the fifties, with their parents. David Reuben still lives in London. His brother Simon lives in Monaco, but has a house in Knightsbridge, and his daughter lives and works in London. Is the penalty for falling foul of Ken to be told to go off "back" to Iran after 50 years in London? How long do you have to live here to "share a sense of being a Londoner"? I also seem to remember that Gerald Ronson acknowledged he had made a contribution to Ken Livingstone's campaign funds for his last mayoral election campaign. No doubt that did not in any way influence Ken's glowing citation of him as a model property developer who "shares a sense of being a Londoner." I've no idea whether Sellar or the Reuben brothers also contributed. Or what exactly Ken means when he talks about property developers coming along to his office and getting involved and making a reasonable contribution. But in these days of agitation about transparency of political funding, perhaps Ken's office will let us know. Well, would you want them supporting your cause? Over at Kesher Talk, Judith is promoting the self-proclaimed "March for Free Expression" in London. I'm uneasy about this particular march. It was still Purim in Jerusalem on Wednesday, although the dressing up and masquerading was finished in most of the rest of Israel and in diaspora communities like London. That's because Jerusalem and other cities in Israel which were walled during the time of Joshua celebrate it by rabbinic tradition on the same day as the Jews of Shushan, the city of King Ahasuerus and Queen Esther. 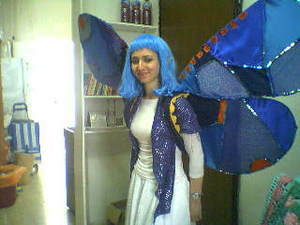 Wednesday was first day my daughter wore her Purim costume, with the carnival-style wings she made. I haven't got good quality photos of her outfit yet, but looking for the wig that went with it introduced me to the world of Goth dressing. Have they got it right again? I'm normally cautious in taking on reports from Debka. They do have a record of scoops on the Israeli-Palestinian conflict and Middle East conflicts generally, but they also seem to me to have a to-the-right-of-Likud agenda. But Debka was the first to report that Al Qaeda was establishing itself in Gaza after the Summer 2005 Israeli disengagement, which was actually acknowledged as established in both Gaza and the West Bank by PA President Mahmoud Abbas just days ago. Now Debka is reporting that the new government of the PA, which Hamas says it will announce on Monday, will include ministerial posts for Israel's newly captured prisoner Ahmad Sa'adat, the leader of the PFLP and mastermind of the Rehavam Ze'evi assassination, and Marwan Barghouti, serving five life sentences for his part in terrorist attacks in Israel. Is it true? Does anyone have any confirmation from elsewhere? On the other hand, the BBC is reporting that the PFLP is not going to be entering the Hamas government, so it wouldn't be likely that its head honcho would become a minister. And what's your guess for which ministries these gentlemen will be assigned if it is true? Sa'adat: Minister of the Interior (he should be inside for some time)? Britain's standing is now at a nadir in the Middle East, proclaims Seamus Milne in today's Guardian. And guess what? He blames it on the supposed collusion of the British for the Israeli raid which led to their rounding up of the PFLP prisoners responsible for the assassination of Israeli government minister Rehavam Ze'evi. Noticed any British embassies being torched across the Middle East? Street protests from Beirut to Bahrain? Burning flags from Damascus to Riyadh? Ambassadors being withdrawn? No, I don't mean over the cartoons. I mean over the British and US withdrawal of their monitors from Jericho jail, or the Israeli raid. Well, sure, Palestinian gunmen in Gaza torched the British Council offices. But then the Palestinian gun gangs of Gaza have a long and unfortunate record of wrecking newly acquired and established Palestinian property, and threatening, kidnap and murder of Palestinian individuals they feel aren't doing what they want. And they are just as likely to kidnap French, Swiss, South Korean and Norwegian nationals as Brits and Americans.